Arya Samaj Mandir in Mumbai, Delhi and Arya Samaj Marriage Fees & Rituals - all that you need to know! Arya Samaj Mandirs have come to the rescue of couples who wish to get married without the pomp and want a low key wedding. Arya Samaj is a spiritual community which believes in the universal message of peace and happiness. They have ten principles based on Vedic teachings that guide the entire community. If you too are planning on an Arya Samaj marriage in an Arya Samaj Mandir, then scroll down and read everything that there is to know about an Arya Samaj wedding. An Arya Samaj marriage will cost you anything between Rs. 5000 to 10,000 depending on which city the wedding takes places. These Arya Samaj Mandir marriage fees are inclusive of the wedding rituals as well as the marriage certificate cost. Just to be sure how much money you will need in hand while you get married, I’d advise to call the mandir you want to get married to and inquire. You don’t want to fall short of cash on your wedding day, do you? What is the eligibility criteria for getting married in an Arya Samaj Mandir? The couple will also be required to get two witnesses, who hold a valid Voter I.card, Driving Licence, Passport, and 2 Passport size photos. The bride and the groom will also be required to get 7 passport sizes photos each. If either the bride or the groom is a divorcee, then they have to carry a certified copy of Decree of Divorce granted by the Court. If either the bride or the groom is a widow or widower, then they have to carry a Death Certificate of their ex-spouse. If either the bride or the groom is not an Indian citizen, the they need to have a No Impediment Certificate / NOC from concerned Embassy and a valid VISA. Apart from these documents, you have to carry one mangalsutra, two jaimalas and 2kg sweet while having an Arya Samaj Mandir marriage. Varmala is the first ritual which is performed in Arya Samaj weddings. The bride and the groom put garlands or varmala in each other’s neck and continue with the following rituals. Madhupark is an Arya Samaj wedding ceremony ritual, where the bride gives Madhupark, a mix of honey, curd, and cream to the groom, which the groom drinks it when offered to him for the third time. Performing a havan is an Arya Samaj Mandir marriage ritual in which the groom ties a thread on his wrist, which signifies his transition of boyhood into manhood to lead a responsible life ahead. The fire in the havan is worshipped while performing this ceremony, where the priests chant the mantras. Kanyadaan is arguably one of the most awaited, yet the most emotional moments of the bride’s father. In this Arya Samaj wedding procedure, the father of the bride gives her hand to the groom. This ceremony signifies that the groom will take care of the bride and she will now be his responsibility. Lajahom is an Arya Samaj wedding ritual wherein puffed rice is offered in the holy fire or havan. The bride and groom are supposed to hold hands, while the brother of the bride gives the rice in their hands to offer to the agni. The phere or parikrama is an Arya Samaj wedding ritual where the couple takes four pheras in front of the holy fire, while the bride prays for the long life and happiness of her husband, and the groom promises to protect, take care and respect his wife. Saptapadi is a beautiful Arya Samaj ceremony, where the couple takes 7 steps together. The 7 steps of this ceremony signify health, wealth, good luck, love, strength, food and offspring. While performing the sindoor ceremony, the groom applies sindoor or red vermillion on the bride’s hairline to symbolize the marital status of the bride. Basically, one of your many solha shringar! Aashirvad or seeking blessings in the last ritual of an Arya Samaj wedding. In this ceremony, the couple bows down to all the elders to touch their feet and get their blessings. Everyone blesses the married couple and wishes them a beautiful life together. 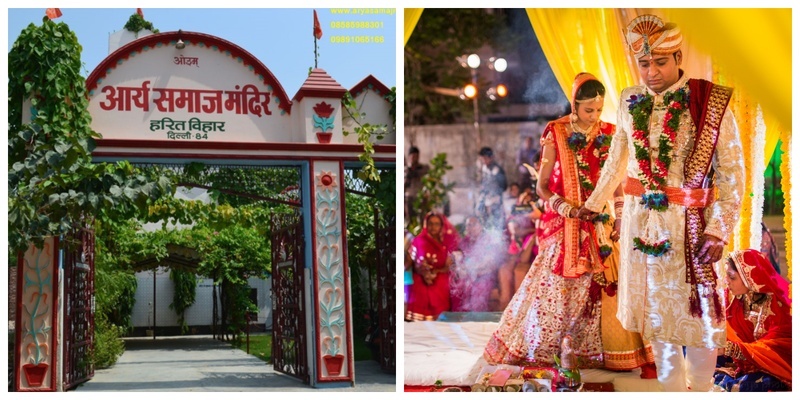 Now that you know everything about Arya Samaj Mandir and Arya Samaj marriage, would you like your wedding to be like this? Image Source: Google unless specified.